Win Palace is the home of many happy online casino players, which should be no surprise given its generous promotions and massive range of games. Offering a classy experience for all kinds of players, and special deals for VIPs, Win Palace makes you feel as if you are playing in a top-notch European or Vegas casino - yet you don't even need to leave your chair to get there! One of the main reasons Win Palace is such a joy to play at is the superior software it uses. 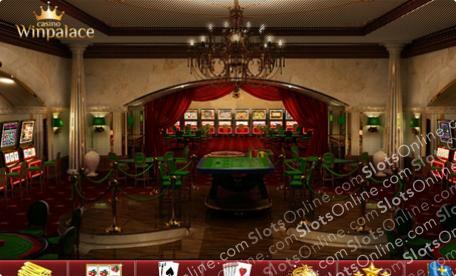 Win Palace software is provided by Realtime Gaming, which is one of our favorite casino software providers. The games all run smoothly, even on older systems, and Mac users can also join in the fun by using the browser-based instant play software. We also like the graphics of the Win Palace games, as the designers have done their most to put an upper crust touch on the layouts of all the slots. Speaking of the Win Palace games collection, there is something for everyone at this casino. You are sure to enjoy Win Palace whether you like 5-reel slots, 3-reel classic slots or bonus slots. Progressive jackpot fans will have a blast with games like Crystal Waters, Treasure Chamber, Field of Green and all the other jackpot slots offering tens of thousands in prize money. If you ever have a taste for a few blackjack hands, then the Win Palace table games collection also has you covered and includes blackjack, baccarat, craps, roulette, and more. Win Palace makes playing worthwhile with lots of great promotions. To start with, you can claim a $1,000 welcome bonus on your first deposit. This is a 200% match deposit, so you can deposit just $500 and get a $1,000 bonus! Also, slots fans can instead choose a 300% match bonus on their first deposit, giving them up to $3,000 in bonus cash for a $1,000 deposit. It doesn't end there, though, as Win Palace is constantly offering weekly bonuses to add to make every day play worth your time and especially your money. We recommend Win Palace to slots players who want to be treated as the creme de la creme regardless of their bankroll. Great software, classy design and massive bonuses make Win Palace one of our favorite online casinos for new online slots players.